Home » Crafting » Valentines Day Shoulder Friends: I am stuck on you! Valentines Day Shoulder Friends: I am stuck on you! It’s amazing how quick kids can create crafts. Earlier this week I had all these crafting supplies dumped on my table and Charlotte walks over, grabs a few things and proceeds to put together this. I’m all like…touche. Maybe you should be running this blog. So yesterday my daughter and I got together after school to create an extension of her original craft that is fun, easy, inexpensive, and makes for a great Valentines Day hand out. PLUS we created a super simple printable that you can cut out that you can add to them and have ready for those Valentines Day boxes at school. The first thing I did was use a heart punch to cut out some hearts on hot pink card stock. I am going to be using those hearts as “feet” for my furry little friends. After the feet were ready, I put them through my sticker maker. If you do not have a sticker maker, you can either purchase one from amazon for $20 (I love mine!) or you can just prebuy the foam hearts that already have a peel-able backing. Now I assembled my little guys by hot gluing a puff ball onto the heart “feet” and then adding eyes, pipe cleaners for “antennas” and other small pieces of decoration to give them some personality. I use the Martha Stewart 3 heart punch, so it punches out 3 different size hearts. I found the outline heart makes a great mustache by just clipping it! You can also clip it to a smile. Once you are done decorating your little Valentines Friend is ready to be stuck on a shoulder! Or if you prefer, you can stick your little guys to a simple printable, cut and hand out to a class room! We used the phrase “I am stuck on you, Valentine” and printed on light pink card stock (which actually made the pink writing look red). I did not have any white card stock laying around, but I would have preferred that look better. Charlotte said she is ready to make 20 of these for her classroom so you know what I will be doing this weekend! Download the printable here and make sure you check mark FIT TO PAGE before you print! Charlotte and I hope you enjoy creating some “friends” for your friends! 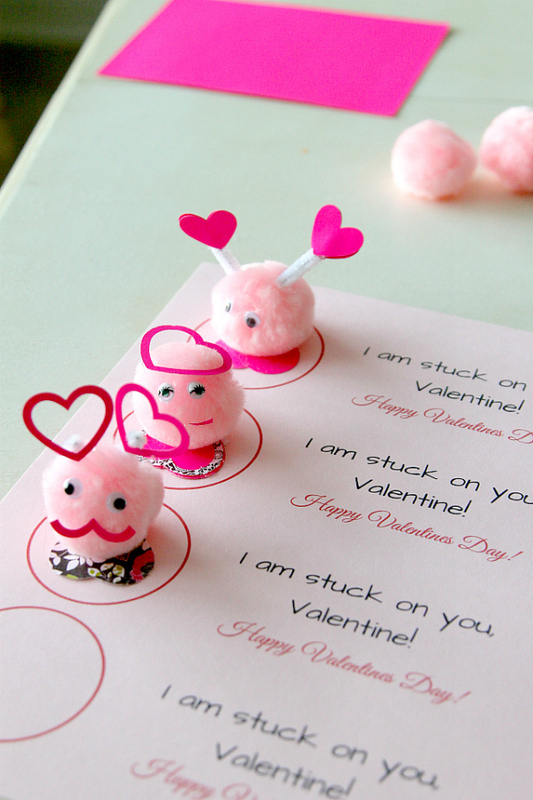 Do you love Valentines Day Crafting as much as we do? We have great full picture and DIY tutorials (denoted with a ) or you can check out some of our amazing blog resources for tutorials from other talented bloggers! These are so cute and I love that you make them as stickers. Thank you for sharing at Sharing Saturday! What a super cute gift idea with the printables! Adorable! I love the little sticker gadget, I’m going to have to get one! Thanks so much for sharing this at Sewlicious Home Decor! I’ve pinned it to the party board and Valentine board! Grrrr…you’re post is driving me CRAZY! Here’s the thing. In middle school, we had a fundraiser and you could earn certain “badges of awesomeness” and they were literally these, but I can’t remember what we called them. I was soooooooo set on earning all of them, too. I’m going to share this on FB with my alumni group and ask them what they were called. Here I am, 30 years old, and I have to admit I never realize I could make them on my own. Charlotte’s brilliant. Honestly I have no idea what to call them either… I thought puff ball with google eyes sounded a little sterile. Let me know if you find out..although Badges of Awesomeness is pretty damn awesome. These are super cute, Trisha!